The first word Allah used is the word Sukoon . Allah said: And among his signs is this: He creates for you mates out of your own kind so that you may find Sukoon with them. So what is Sukoon? It is a word that we use in Urdu as well so I am sure all my friends who understand Urdu have an idea about its meaning. In Arabic, Sukoon is the opposite of Al – Haraka – or movement. In Arabic grammar the equivalent of the maatra on the letter is called Al-Haraka which tells us how the letter “moves” meaning, how it is to be pronounced. When there is a Sukoon on the letter it means that the letter remains as it is and will not move and will be pronounced in its original form. Allah has used the term Sukoon as the first purpose of the marriage. He said that He creates mates for us so that we may find Sukoon with them. So that we may find contentment with them. So that we may find peace and tranquility with them. Not so that we now have a permanent sparring partner with whom to test our strength and show who has the upper hand. 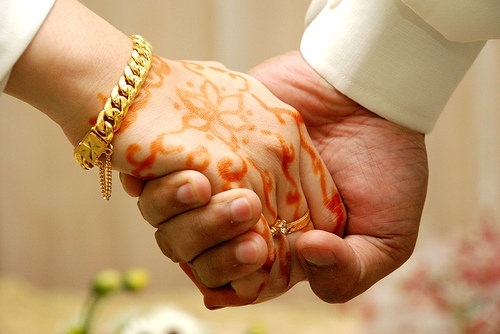 The first condition of the contract is that the spouses are undertaking to promise that they will henceforth lead their lives in such a way that they will make their companionship, their home, their being together and their support for one another a source of contentment and Sukoon for each other. They are making Allah a witness that henceforth they will not look elsewhere other than towards each other for all the requirements of marriage. That their eyes, ears, hearts, hands, feet will not stray away from their spouse. That there will be no Haraka, no movement away from the spouse. I ask Allah to give us all Sukoon with our spouses. It also means that both will make an effort to create a home which is a place of Sukoon which they look forward to returning to after having been away from it for various reasons. Like a ship which has been battered in a storm and is now safely entering the port where it can look forward to being attended to and cared for, the home is the port to which the spouses must be able to return, to be cared for by each other. How terrible it would be if there is a permanent storm in the port. Where then will the battered ship go? Sukoon is the first essential of a good marriage. The second word that Allah has used in this verse is: Al-Mawaddah: where He said: “wa ja’ala bainakum mawaddah”: And He puts love between you. This refers to the love that the spouses feel for one another. This love is both physical and emotional. Love is an outcome of respect. We can’t love someone for whom we feel no respect. It is essential therefore for the spouses to pay attention to the good from each other and to forgive the mistakes. The spouses are like mirrors to each other. They reflect what they see but they have selective memory. When a new image comes before the mirror it is reflected with reference to the good from earlier images, whatever it was. Someone sent me a story which talked about writing the good about our friends in stone and writing their mistakes in the dust. One remains for a long time while the other is blown away by the first breeze that comes. I believe this is the single most important secret of a good marriage. To have this selective memory for the good and selective amnesia for the bad. We need to give our spouse a Lifetime Pass. Permanent forgiveness for all that they do in return for all the good that we receive from them. And to do this not with some feeling of superiority but because we are acutely aware that we are in equal if not more need for such forgiveness. Forgiveness is the secret of a good marriage. It is not that people don’t make mistakes, but that those who they transgress against treat a mistake as a mistake and don’t wait to joyfully extract retribution. They are too fearful about Allah treating them in the same way. Unfortunately many people have the opposite attitude which is the root cause of all problems. The good from the spouse is taken for granted as one’s right while any mistake is seen as a premeditated crime and remembered permanently, recalled frequently and punished repeatedly. Islam advises the opposite. To forgive not once but 70 times, without reservation. For the spouse, his or her companion is their best friend. The marriage is a contract where the spouses are undertaking to make each other, their best friends from this day on. It is important to remember however that friendship is only as good as the amount of investment you make in it. It is not magic. It is not automatic. It does not happen. It is made. Consciously. With effort. And the returns are directly proportional to the investment. It is necessary to spend time with your spouse, not with your other friends in some club. It is necessary to develop common interests. It is necessary to take pleasure in each other’s work and activity. It is necessary to support each other in all that is good. It is necessary to ensure that you give feedback with care and concern and never in public. It is essential to remember that between spouses there are no defenses because there is trust. And for that reason it is essential for the spouses to exercise special care in dealing with each other’s emotions. It is necessary to build a language together, a language of looks, words, signs. A language that over time becomes almost magical in how it enables one spouse to know what the other is feeling without explanation. A language which is a joy to see when you look at those who have been happily married for many years. It is necessary to consciously remember the good that one spouse does for the other, especially when they are having a bad day and are acting strange. It is essential for the spouses to honor each other because the honor of one is the honor of the other. If one spouse treats the other without respect they are only insulting themselves. In our culture where we live in joint families it is essential to honor the parents and family of the spouse because she/he loves them. It is important to remember that when children come they will unconsciously imbibe all these things from their own observation. They will see how you treat each other’s parents and the day will come, when they and their spouses will treat you the same. It is common today to hear young people ask questions about their ‘rights’ in the marriage and with respect to the families of the spouse. Remember that it is only for actions over and above the call of duty that a soldier gets a medal. So also it is only what you do over and above your duty that will gain you the love and respect of others. So don’t focus on your rights but focus on the rights of others on you and do more than what you think they ‘deserve’ so that Allah will give you more than what you genuinely deserve. Someone came to Shaikh Abdul Qadir Geelani and presented him with some money and said, ‘Please give it to some deserving people.’ Shaikh Abdul Qadir Geelani asked him, ‘Do you ask Allah to give you only what you deserve?’ Similarly there is a story about a young woman who was complaining about her husband to her mother. The mother said, ‘I agree with you that he has all those faults. That is why he married you. Otherwise he would have found someone much better.’ It is important not to become too ‘tough’ on your spouse and embark on a crusade to turn him or her into a paragon of virtue and grace. In the unlikely event that you succeed, you may find that you are no longer fit to be their spouse. Far more likely, is that in the course of your endeavor you will alienate them totally and destroy your marriage. Much better for you is to let the faults remain and learn to love your spouse despite the faults. As long as the fault is not one that is bad in the Shari’ah (i.e. prohibited by Islamic law), leave it alone. Look at all the virtues that overshadow the fault. Learn to forgive because you also need forgiveness. If not from him/her then definitely from Allah. The Prophet (peace be upon him) said (meaning), ‘The one who hides the faults of others in this life, Allah will hide his faults on the Day of Judgment.’ He or she is your spouse. Your spouse is not a patient and you are not a doctor. They did not marry you because they wanted to be changed or improved. They married you because they loved you and you loved them despite the faults. Try to recall that every time Satan reminds you of their faults. This is the love that Allah talks about when He says that He has put it between the spouses. Like all hidden wealth, it has to be accessed or it will remain buried under the sand. There is no limit to expressing love for one another. Do it day and night. Do it on occasions and without any reason. Do it just for the pleasure of doing it and you will realize that in the giving it enriches you even more. Let me ask you, ‘When was the last time today that you kissed your spouse? Or hugged him or held her hand?’ Yes, I said today because if more than a day has passed then something is seriously wrong. When was the last time you gave her flowers? When was the last time you bought him a present even when there was no ‘occasion’? When was the last time you wrote him or her a love letter? ’ Love may well exist in your heart but your spouse is not a mind-reader. It is only by expression that love increases and rewards the one who expresses it. Islam encourages you to express your love for your spouse frequently and regularly. The last word that Allah used in the ayah is Rahma: Mercy; when He said: Wa ja’ala bainakum mawadaatawn wa Rahma. Rahma is a special quality of Allah Himself. It is the mercy that He shows to His creation even when they don’t deserve it. He used this word to describe the relationship between the spouses in the marriage. We are merciful to those who we feel responsible for. We are merciful to our children whereas we may not exercise the same mercy for a stranger’s children. However when you are the teacher in a school the same children become your wards and you are merciful to them. The word Rahma in the context of marriage draws our attention to the responsibility that the spouses have for one another. It also draws attention to the fact that over the years each has made a lifetime’s investment in the other. To show Rahma – to be merciful – is to honor that investment and to thank the other for making it. Not to take this for granted. Rahma is the quality of being kind even when the other doesn’t deserve it, just as Allah is kind to us even though we can never say that we deserve His kindness. Rahma is also the quality when for reasons of life and destiny, when one of the spouses is unable to look after the other or to satisfy them, the other still treats him or her with love and respect and mercy. Rahma is to give without asking for return. To give because there is a pleasure in the giving itself. Marriage in Islam is therefore a commitment of integrity, love, respect and mercy that the spouses are undertaking to make to each other in the presence of Allah who is Witness to all our thoughts, intentions and actions. I ask Allah to bless this union, to fill the lives of these young people with His Mercy and to make them Standard Bearers of Islam in every sense of the term so that when they stand before Him on the Day when all of us will stand before Him, He will be pleased with them. I ask the same dua for all of us. < Previous I live in a miserable world. I just happened to read this post and may I say that it is so informative. I have read a lot of articles, posts, etc written about Islamic perspective of marriages, but very few have actually made it clear logically, and that list definitely includes this particular sermon. Thanks for posting it and I just wanted your permission if I could share this online. Please feel free to share with credits given to Yawar Baig. Sure, just make sure you’ve mentioned and given due credit to Yawar Baig as I have in my post as he is the author of these words. One of your best pieces Zayn, I remember how mesmerized I was by it when I read it the first time. So glad that you decided to share it, because this is absolutely IT, for anybody married, seeking to get married, or simply just lying in their beds and thinking of who he/she might be. Hidayah, this post is by Mirza Yawar Baig: it was a khutbah he delivered at my cousin’s wedding. Found it too good not to share!